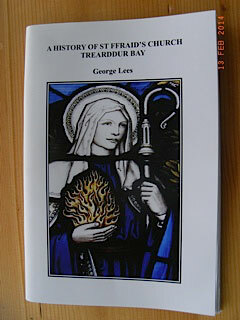 St Ffraid’s Church was built in 1931, by John Jones of Black Bridge, Holyhead. Gilbert Fraser of Liverpool was the architect. The Church is dedicated to the Irish SaintBrigid, which is Bhride in Gaelic, from which we get Bride in English and Ffraid in Welsh. This is the fifth Church of St Ffraid in Trearddur. The firstCapel Sant Ffraid was established in the centre of the beach sand hills between 500 and 800 years ago. At least seventeen other churches in Wales were dedicated to StBrigid of Kildare and most of these were built in the 14th century. By the end of the 18th century Capel Saint Ffraid’s was in ruin and soon disappeared without trace from the burial mound on which it had been built. The Church was re-established in 1848 when a small wooden church was built on the common at Porth-y-Post. This was given by MrsLongueville of Eccleston Rectory, near Chester. In 1926 the vicar of Holyhead launched an appeal to build a permanent stone built church. It was funded mainly by summer visitors from Cheshire and the Wirral. The Church was dedicated on 2nd April 1932 but was not consecrated until 24th August 1957. St Ffraid’s Church normally has a Holy Eucharist every Sunday morning. Music can be provided by a pipe organ, piano or CD’s. StFfraid’s is a popular location for Baptisms and Weddings. The local congregation is supplemented every summer, Easter and Christmas by regular visitors who enjoy the warm welcome they receive at St Ffraid’s. Copies of this book are available for £3.00, including post and packing. Please call 01407 860752 to order a copy. Proceeds for church funds.